Bol Bol of the Oregon Ducks reacts to a call in the second half against the Syracuse Orange during the 2K Empire Classic at Madison Square Garden on November 16, 2018 in New York City. Bol called Oregon his “dream school” and thanked Ducks fans in a tweet. 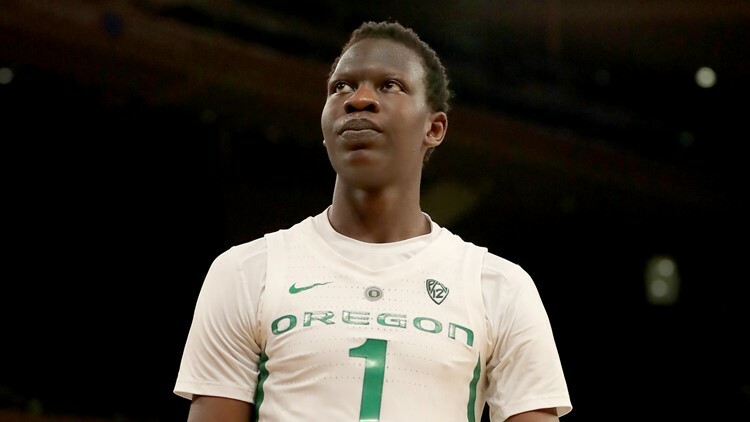 The Bol Bol era is over at the University of Oregon. The highest ranked recruit in Oregon basketball history on Thursday announced that his season has come to an end amid reports that his foot injury required surgery. Bol called Oregon his “dream school” and thanked Ducks fans in a tweet. According to Shams Charania of The Athletic, Bol underwent surgery to repair a foot fracture and will likely use a walking boot and crutches for the next 8-10 weeks. He will return to basketball activities this summer as he prepares for the NBA Draft, where many experts projected Bol to be one of the top selections. During his nine-game career at Oregon, the 7-foot-2 freshman averaged 21 points, 9.6 rebounds and 2.7 blocks per game.